AOC has recently released their latest WQHD IPS monitor that is geared towards cinema enthusiasts and demanding multi-task users – the AOC u3477Pqu Ultrawide IPS monitor. 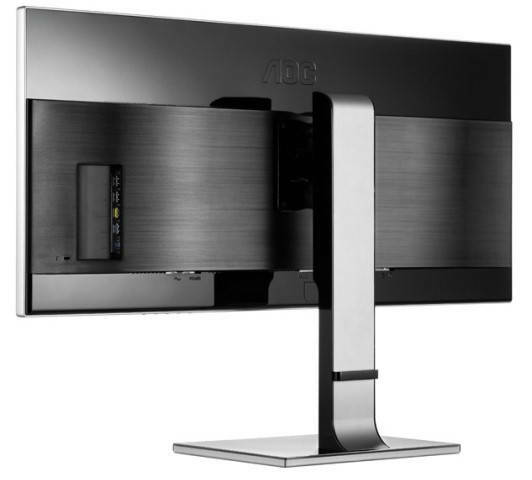 The AOC u3477Pqu is a 34-inch WQHD monitor featuring a 3440×1440 display resolution, 21:9 panoramic screen, 10.7 billion colors and 4.95 million pixels. Check out the rest of its features and specifications below, as well as its price and availability. The AOC u3477Pqu boasts an impressive resolution of 3440 x 1440 pixels on the more than a quarter of a square meter display area, and the aspect ratio allows viewers to watch movies without black bars on top and bottom. Thanks to a great interplay between hardware and software, users can easily watch a movie and play a computer game at the same time on the same screen. Alongside many different ports like USB 3.0 and DisplayPort, AOC offers an integrated HDMI port with MHL functionality which enables the user to directly mirror smartphones and tablet screens onto the big screen. Multimedia editors, engineers as well as stock market analysts or any other professionals working with spreadsheets are likely to appreciate the benefits of the model’s productivity-enhancing features. Gone are the days with endless scrolling or switching between different windows, since a display area of 79.9 x 33.5 cm – more than a quarter of a square meter – enables the user to place almost four A4 pages alongside one another, or get a quick overview over 16 video streams, e.g. from surveillance cameras, displayed side-by-side without distortion. 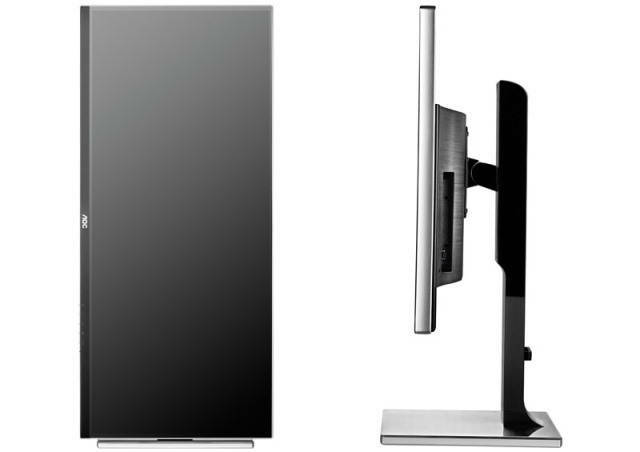 Noteworthy too is the fact that the monitor has the same height as a 27″ monitor. Thus, you don’t need to move your head up and down when viewing complex diagrams. What’s more, due to its size as well as its sharp and detailed image, this screen is also useful for presenting content to a group of people. Equally noteworthy are the picture-in-picture and picture-by-picture features, which allow watching images simultaneously from different sources. In addition, thanks to AOC’s innovative Screen+ software which divides the large display into up to four panes, brokers – for example – no longer need to decide between watching the stock market performance and finishing equally important work for the next day. Full ergonomic flexibility results in higher productivity. Therefore, the 34″ display comes with a wide range of features that help to reduce fatigue: height adjustability of 130 mm, pivot, swivel and tilt. Furthermore, the monitor can be fixed on VESA compliant wall mounts and racks. 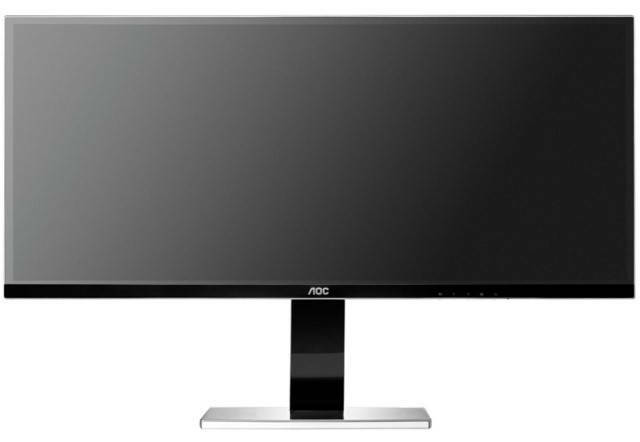 AOC’s largest IPS monitor, the u3477Pqu, offers an impressive 4.95 million pixels on a screen diagonal of 34″ (86.7 cm). For demanding multi-task users and cinema enthusiasts, as well as those looking for a monitor that combines productivity and cinema feeling, the u3477Pqu delivers top-notch and finely detailed pictures displayed in a 21:9 format. Thanks to the Real 8-bit +FRC arrangement, more than 1 billion colors can be produced. Impressively, the 34″ model delivers a very high refresh rate of 60 Hz and a pixel response time of 5 ms only. Thus, the display is eminently suited for fast-paced entertainment such as computer games. In addition, with the u3477Pqu, AOC has managed to significantly improve the Mura uniformity issue; an effect that looks like clouds on dark screens of many monitors. Equipped with various signal sources, great color management, crystal-clear images and a set of integrated 3W speakers, the monitor is ideally suited for watching movies that require superior resolution and sound. Furthermore, the slick bezel design with ultra slim borders allows multi-monitor users to group several displays together making them appear as one large uninterrupted work space. The 34″ monitor also utilizes a high-grade IPS panel for extra wide viewing angles of up to 178° both vertically and horizontally. On top of that, with a luminosity of 320 cd/m², the u3477Pqu is even suited for working environments with bright ambient light. Like with many other of its monitors, AOC provides the u3477Pqu with manifold connections and keeps an eye on the environment. Alongside sustainability certificates such as EnergyStar 6.0 and TCO 6.0, the model also comes with intelligent software such as Eco Mode and e-Saver. 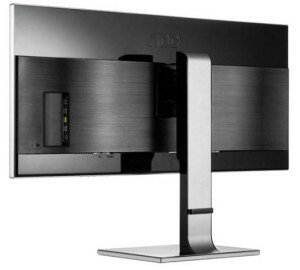 Furthermore, AOC equips the 34″ monitor with four USB ports, two each of the 2.0 and 3.0 standards. Finally, the integrated DisplayPort makes sure that image transmissions are fast and seamless. For Android enthusiasts, the HDMI connector also offers MHL (Mobile High-Definition Link). MHL enables the user to directly mirror smartphones and tablet screens onto the big screen. Thus, connecting a smartphone with the 34″ WQHD monitor can make video calls an even better experience, or allow the user to showcase presentations stored on the smartphone with ease. 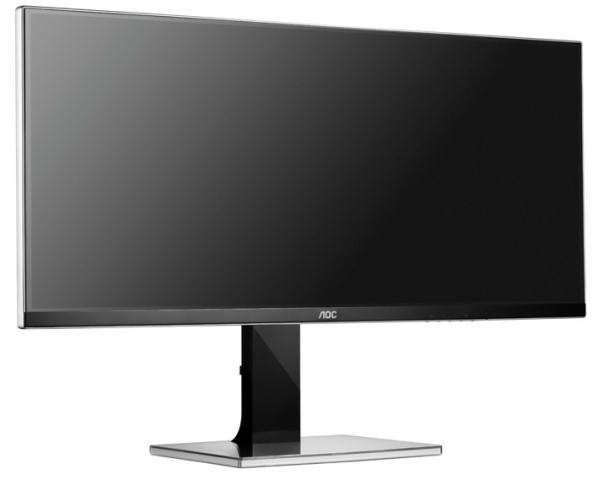 The AOC u3477Pqu WQHD IPS monitor has a manufacturer’s suggested retail price of £499 GBP (including VAT), or that’s around $850 USD. It comes with a 3 year warranty from AOC and on-site exchange service, and will be available starting September 2014. I’ll try to post an update later when this monitor becomes available to order online. Crucial MX500 2TB SSD Review – A Good Value SSD?